Hamby Home(in)stead ...: Pilfered Plum Preserve! We've been eyeing off the local plum trees for a few weeks. 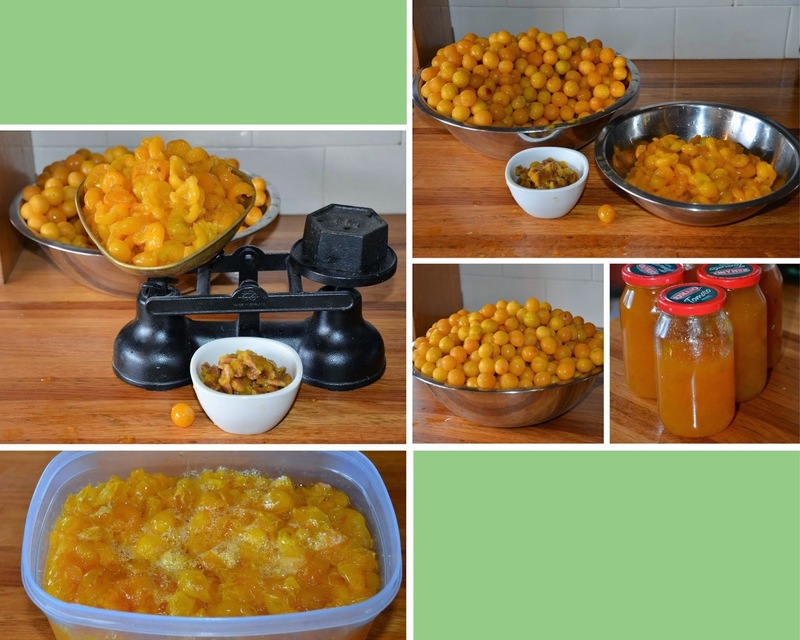 You might remember last year we scored about a kilo of red plums for a Pilfered Plum Pie and then gained another kilo of mainly yellow plums to make plum chutney? We did even better yesterday! 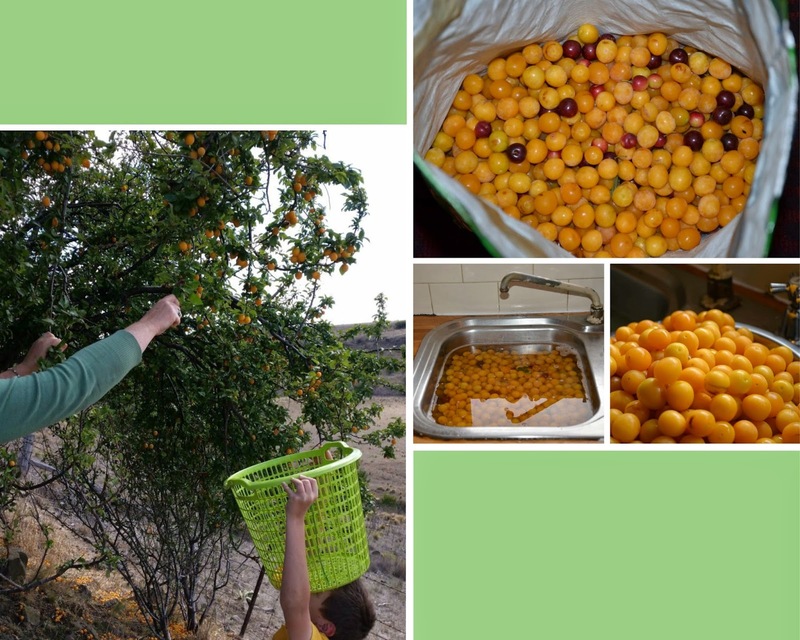 Erin and I stopped by the yellow plum tree and easily picked a kilo or so. In the late afternoon we returned with Vaughan and our combined total was 4.5kg! I washed all the plums this morning and then set about making plum jam. I did some quick research first. Although I'm fairly comfortable making chutney and relish, I have less experience making jam. Lovely Annabel at "The BlueBirds are Nesting" blog posted a method for making microwave jam, so I tried that. The plums are softer this year and it was easy to squeeze the pips from the flesh, which is far quicker than trying to cut the fruit from the stones as I did last time! When I had a kilo of fruit, I tipped it into a microwave-safe container and added sugar and lemon juice. Our microwave doesn't have a working light. It's not usually an issue but would have been handy for watching jam come to the boil - or boil over! I lost a bit of my first batch. Even so, it made two full jars. I did better with my second batch (after cleaning the microwave) because I used a lower power setting. It yielded two and three quarter jars. Of course, taste-testing is an important part of the process so I made a quick batch of lemonade scones and whipped some cream. I think it's an indication of the jam-making success that there is no photographic evidence of the Devonshire scones! I expect I have a bit over two kilo of plums left to make more jam or perhaps chutney but that's a mission for tomorrow - and once I've finished, I'll need to wash the sticky kitchen floor! Edited to add - I went out today to buy lemons for the jam-making. They were $9.99 a kilo! Lucky the plums were free, eh?! I checked the price of plums while I was in the shop. They were $3.99 a kilo, admittedly a lot larger than our freebies but we even so, our haul was quite a saving. I've just now calculated the cost of ingredients for today's two batches of jam - $2.90 for nearly five jars. Gotta be happy with that! Like living in an ... aquarium? !